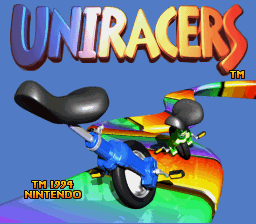 Uniracers was a really unique and fun racing game for the SNES. 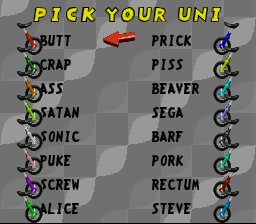 It allowed you to name your racer, but it prevented you from using profanity and several other words and names (like “Satan” and “Sega”). Try opening Uniracers up in a hex editor and doing a relative search for the first profanity that comes to mind, and you will find a lengthy list of banned names. This hack overwrites the list to un-ban these forbidden gamer tags. If you want to name yourself “PUKEBALL” or “GONADBRO,” then go for it. It’s a free country, man.